STUTTGART (Bloomberg) -- Volkswagen AG may need to put on hold a merger with Porsche Automobil Holding SE due to be completed next year until risks from U.S. lawsuits and German tax issues are resolved, VW CEO Martin Winterkorn said. Volkswagen agreed to merge with Porsche in August 2009 after the sports car maker's debt tripled to more than 10 billion euros ($14 billion) following a failed bid to buy VW by securing stock through options transactions. VW has since bought 49.9 percent of Porsche's operating unit, Porsche AG, for 3.9 billion euros, setting the stage for a merger in 2011. Porsche is being sued by U.S.-based short sellers of VW stock who claim the sports car maker secretly cornered the market in VW shares and later caused them more than $1 billion in losses. The suit was filed in Manhattan federal court by Elliott Associates LP, Glenhill Capital LP, Glenview Capital Partners LP and other short sellers. The court will decide in January whether to let the case go forward. VW's merger with Porsche is also being hampered by negotiations with German tax authorities over the tax-exempt status of profits from Porsche's options transactions. Legal requirements tied to Porsche's structure would result in higher taxation if the two were to merge before the end of 2014. 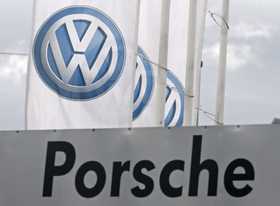 Should the planned merger founder, VW would be prepared to switch to using a put/call structure that allows Porsche to sell the rest of its carmaking operations to VW for cash. Porsche's debt shrank to 6 billion euros on July 31 from 11.4 billion euros a year earlier, mainly because of the 3.9 billion euros VW paid for its 49.9 percent stake. Porsche has said a ruling by the U.S. Supreme Court this year limiting foreign investors' ability to sue companies based abroad in U.S. courts will be a help in battling the pending lawsuits. Porsche shareholders will be asked Nov. 30 to approve a capital increase of about 5 billion euros in the first half of 2011 with the carmaker's controlling shareholders, the Porsche and Piech families, due to contribute 2.5 billion euros. The capital increase, which may also include issuance of convertible bonds, will help Porsche pay back a 2.5-billion euro bank loan slated to expire June 30, 2011. Lenders have agreed to give Porsche additional time until Oct. 31, 2011, to repay the facility should the capital increase be thwarted or delayed for any reason.